The story begins in the year 1799, and most of the action takes place on the man-made island of Dejima in Nagasaki, Japan. This is the farthest outpost of the Dutch East Indies Company and foreigners are kept restricted to the island. It's the only contact point between Japan and the West. This epic tale starts out dramatically with a young midwife helping a Japananese magistrate's concubine with a difficult birth. The midwife is named Orito Aibagawa, and she has a disfiguring scar on one side of her face. With the support of her father she begins to study medicine under the tutelage of the brilliant Doctor Marinus. After this dramatic opening, we are introduced to Jacob de Zoet, a young Dutch clerk who has just arrived in Dejima. Jacob is hoping to work for 5 years and make enough money to go home and marry his fiancee. He stands out not simply because he is so virtuous and decent, but also because of the color of his hair - bright red. 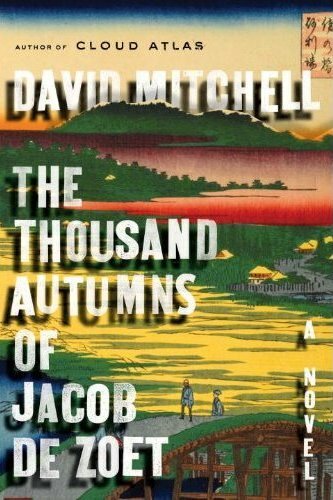 Jacob will learn that his fellow merchants, supervisors and Japanese translators are not always to be trusted, and that things are not always as they appear. Other important characters in this novel include Ogawa Uzaemon, an honorable young translator who faces a difficult moral dilemma. We meet high-ranking Japanese officials including Magistrate Shiroyama and the malevalent Lord Abbot Enomoto. In fact there is a huge cast of characters, many with their own fascinating backstories. And did I mention a thieving monkey named William Pitt? This book is wonderful on so many levels. It succeeds as a rousing old-fashioned adventure tale with nail-biting scenes taking place on both land and at sea. It's also an amazing historical where we really are transported back in time and place and learn about Japanese custom and their relationship with the West. And it works as a romance novel, where we find ourselves rooting for both the safety of our protagonists and for their finding happiness and love. 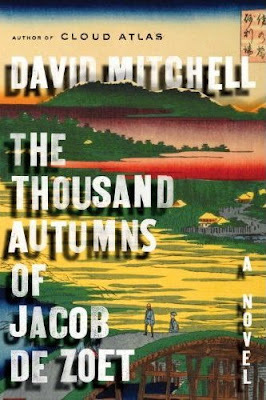 But this is a David Mitchell novel, so we really don't know if that is going to happen, and there is palpable sense of anxiety and dread as we read further and further on in this magnificent story. Like this author's previous novel, Cloud Atlas, it took me a while to get hooked. In fact, it took me quite a while. There are a lot of names to remember and it can get tough trying to keep everyone all sorted out. But by the second section (the book is divided into 5 parts), I could not put it down. In fact I am writing this review at 3am because I was simply unable to stop reading. I read this one, he's great! a great book, I like this author! not my favorite but a pretty damn good book! I won't spoil the plot by revealing what exactly is indigestible but the author has included something that is as silly as UFO's landing in Edo in 1799 to seize the Shogun and set up Howdy Doody in his place. Why? I dunno. It isn't needed. It doesn't advance the story. It's really a terrible flaw. That said, the rest of the book is pretty darn good -- 98 out of 100; then take 45 penalty points for 1 MAJOR flaw. So buy the book and enjoy what is good. You'll know of what I speak when you get there. Just ignore the absurdity of the one problem and soak up the rest of the goodness therein. It'll butter your artichokes.